William was born in 1892 in Banstead Surrey. 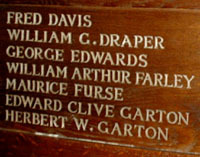 He was the son of Frederick Farley and Emily Parsons of 13 Mint Cottages, Park Road, Banstead. Frederick Farley, originally from Burgh Heath was a General Labourer. William was one of four children, the others recoded in census as an elder brother, Charles Frederick, and two younger sisters, Emily and Rose Farley. At the age of eighteen William was a domestic gardener in Banstead. The 13th (Service) Battalion was formed at Hounslow on 13 September 1914 as part of K3 and attached as Army Troops to 24th Division. In December 1914, William Married Grace Edith Finch. Grace, born May 1894 in Warsham, Norfolk, was the daughter of John Finch and Elizabeth Sutton. Her younger brother, Walter Leedell, married Rose Farley, the younger sister of William Farley. In March 1915 the battalion was transferred to then 111th Brigade of the 37th Division. They landed at Boulogne on 30 July 1915. 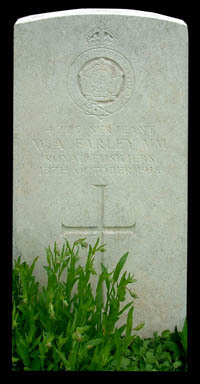 William died of wounds in France in October 1918. It is possible that William was wounded on the 4th October when the 13th Royal Fusiliers attacked with 13th KRRC and were supported by the 10th Royal Fusiliers. Both battalions were in 111th Brigade on 4th October. The Day-by-Day Account notes that 'attacking at 6 am, they came under fire from a blockhouse and Lewis Farm, which had been missed by the barrage. This hindered the Fusiliers as they performed a wheeling manoeuvre with the aim of taking the dug-outs strung out in the northern part of Gheluvelt Wood. As they wheeled they came under increased fire from Lewis Farm and the blockhouse and were forced to dig in short of their final objective'. Grave Reference: XIII. D. 15.